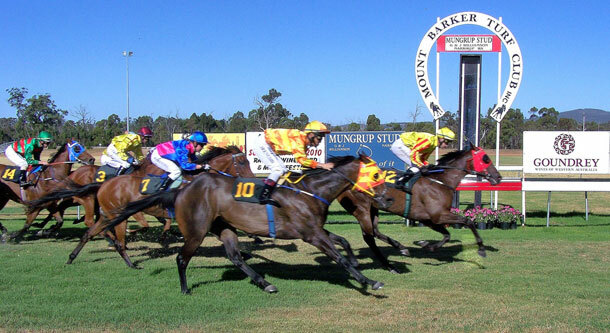 Mt Barker Racecourse is a quaint racecourse in the shire of Plantagenet, which is located 368 kilometres south west of Perth and 50 kilometres north of the coastal city of Albany. Operated by the Mt Barker Turf Club, the racecourse first began operation in the early 1890’s. Mount Barker is home to the largest thoroughbred stud in the state of Western Australia, as well as being a vibrant hub of vineyards and fine wine. Mt Barker Racecourse is home to four feature race days each year, including the Grapes & Gallops, which takes place in January. The Grapes & Gallops Race Day includes nine quality races that are regarded as the highlight of the Great Southern racing season. The day’s feature event is the $90,000 Mungrup Stud Sprint, which is renowned for consistently attracting high class gallopers. The XXXX Gold Mt Barker Cup Day winds up the track’s racing season when it is run in March each year. The 2,000 metre race was first run in 1948 and to this day continues to remain as one of the integral race days at Mt Barker Racecourse. The course also holds the annual Michelle Parsons Pink Ladies Day each October, as well as the New Years Eve Eve Race Day in December. Mt Barker Racecourse also hosts two other race meets throughout the year.